Please Email info@TreasuredHeirloomsCrochet with any questions before ordering. I'll be adding to the list periodically, so if you're looking for something special, keep checking back! 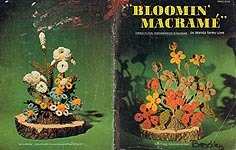 Bloomin' Macrame, designed by Wanda Seney Love, Crown Crafts & Notions, Inc., 1976. Unique floral arrangements in Macrame. Instructions include: Leaves, Fillers, Basic Flower, Lily, Trillium, Cactus Flower, Large Double Flower, Curly Poppy, Blue Ruffles, Tulip, Tropical Rose, Red Amaryllis, Two Color Flower, Iris & Daisies. 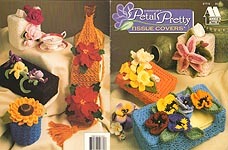 Crochet Petal Pretty Tissue Covers, designed by Mary Layfield, Annie's Attic, 1994. Designs worked with worsted weight yarn include: Basic Boutique Tissue cover, Basic Facial Tissue Cover, Basic Side Opening Tissue Cover, Basic Tissue Roll Holder, Basic Tissue Roll Cover, Basic Travel Size Tissue Cover; Pansy, Poinsettia, Daffodil, Rose, Iris, Sunflower, Lily. Country Flower Baskets, designed by Sue Childress & Josie Rabier, House of White Birches, 1999. Three crocheted flower bouquets with matching centerpiece doilies: Pineapple Tulips, Angelique Doily, Spring Bouquet, Modesty Doily, Roses & Carnations, Triple- Leaf Doily. Ornamental Crochet!, designed by Carol Smith, The Crochet Catalog, 1988. Projects include: Spring Bouquet (Tulip, Daffodil, Iris, & Leaves), Triple Hearts photo frame, Nesting Egg, Pineapple Bell, Southern Bell, and Basket of Violets. Excellent condition. Plastic Canvas Nature's Towel Toppers, designed by Renee Stewart, The Needlecraft Shop, 1997. 3-D designs stitched on 7- mesh include: Grapes, Strawberry, Lemon, Pineapple, Eggplant, Carrots, Lettuce, Corn, Sunflower, Violet, Pansy, and Poinsettia. Plastic Canvas Fun Fruit Fridgies, designed by Vicki Blizzard, The Needlecraft Shop, 1994. Designs on 7- mesh include: Apple, Pear, Grapes, Pineapple, Lemon, Cherries, Blackberries, Limes, Banana, Peach, Orange, Strawberries. 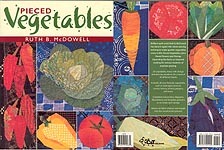 Pieced Vegetables, designed by Ruth B. McDowell, C & T Publishing, 2002. 20 vegetables, many with designand piecing variations, for a total of 38 different blocks, and a sampler quilt. Vegetables included: Artichoke, Asparagus, Green Beans, Shell Beans, Beets, Broccoli, Cabbage, Carrots, Celery, Corn, Eggplant, Leeks, Lettuce, Onions, Peas, Peppers, Potatoes, Pumpkin, Squash, and Tomatoes. 128 pages. 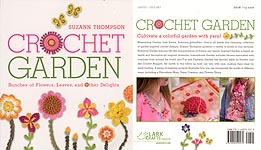 Crochet Garden, designed by Suzanne Thompson, Lark Crafts, 2012. "A variety of mitifs in four sections: Botanical Garden featured life- like interpretations of flowers and leaves; Inspired Garden is based on textile and decorative- art inspired blossoms; International Garden includes blooms associated with countries from around the world; and Fun and Fantastic Garden has fanciful takes on flowers. A series of inspiring projects illustrates how you can incorporate the motifs in different ways, including a Pincushion Mum, Daisy Coasters, and Flowery Shirts." BRAND NEW! Veggie Pot Holders, designed by Annie Potter, Annie's, 2013. 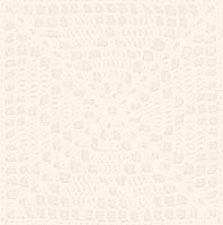 Updated reprint of early Annie's favorites -- Carrots, Corn, Cauliflower, and Onion worked in worsted weight yarn. BRAND NEW 2013 RELEASE! 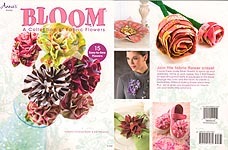 Bloom: A Collection of Fabric Flowers, designed by Kimberly Christopherson & Kris Thurgood, Annie's, 2012. 15 easy to SEW flowers, including Folded Blooms, Looped Blooms, Poinsettias, Pinched Blooms, Twist &Turn Flower, Friendship Blooms, Canvas Petals, Rickrack Rings, Rolled Roses, Yo- Yo Bracelet, Pretty Petal Bowl, and Spiral Roses. Brand new 2012 Release! 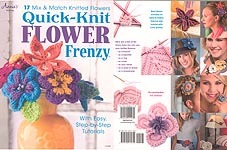 Quick- KNIT Flower Frenzy, Annie's, 2012. 17 Mix & Match KNITTED flowers with easy, step- by- step tutorials: Dahlia, Poppy, Day Lily, Primrose, Double- Beaded Pansy, Fantasy Flower Duo, Sakura, Daphne, Golden Columbine, Pinwheels & Stripes, Blackeyed Susan, Buttercup Lariat, Larkspur, Roses in Bloom, Quick Color Wheel Wreath, and Petite Petunia Ring, plus ideas for use in hair ornaments, belts, brooches, rings, hats, on shoes, on scarves or shawls, to decorate lampshades, etc. Brand new 2012 Release! 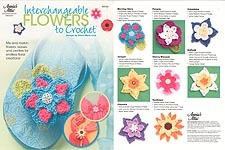 Interchangeable Flowers to Crochet, designed by Cherie Marie Leck, Annie's Attic, 2011. Mix and match flowers, leaves, and centers. Designs include: Water Lilly, Gerbera Daisy, Poppy, Poinsettia, Daisy, Rose, Morning Glory, Petunia, Columbine, Daffodil, Cherry Blosom, Jonquil, Clematis, Sunflower -- or use your imagination! Brand new! Patons Fabulous Flowers, Patons, 2005. 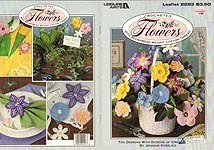 Digest-size book with Flower designs from 2" - 5" wide to use as trims, worked in a variety of yarns . One design to KNIT and 6 to CROCHET Brand new 2011 design! 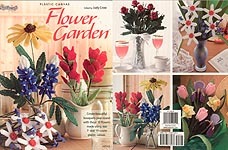 Plastic Canvas Flower Garden, edited by Judy Crow, The Needlecraft Shop, 2009. 10 flowers using 7- and 10- count plastic canvas: American Beauty Rose, Black Eyed Susan, Indian Paintbrush, Texas Bluebonnet, Tulip, Daffodil, Iris, and Daisies. Brand new! but now out of print. Crocheted Flowers With Bedspread Weight Cotton Thread, designed by Jennine Korejko, Leisure Arts, 1992. Designs include: MountainLily, Daffodil, Grecian Windflower, Daisy, Iris, Morning Glory, Pink Buttercup, Rhododendron, Hydrangea, Peach Blossom. Alson instructions for use as Napkin Ring, Bookmarks, Curtain Ties; additional suggestions. Tags on cover, but otherwise excellent condition. Fashion Flowers To Crochet, designed by Darla Sims, American School of Needlework, 2005. 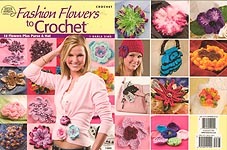 18 Flowers in a variety of yarns plus purse & hat. Designs include: Serendipity Flower, Purple Flowered Hat, Rainbow Bright, Kathy, Beaded Rose, Saheyo, Poinsettia, Pansy, Jessica, Madison, Dawn, Kaylie Doodle, Tasha, Lori Ruffled Bag, Just For Fun Flower, Diann, Sizzling Sunflower, Topicana. Tag smudges on back cover; otherwise, very good condition. Flowers For You, Supplement to Leisure Arts the Magazine, Leisure Arts, 1994. Projects include: COUNTED CROSS STITCH: Sunflower, Bouquet of Violets; CROCHET Rose Afghan, Floral Button Covers (Rose, Black- Eyed Susa, Pansy, Carnation). Price tag on cover; otherwise, excellent condition. 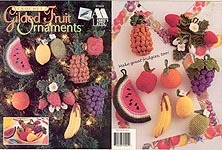 Crochet Gilded Fruit Ornaments, Annie's Attic, 1996. Designs for tree ornaments, home decor, or fridgies include: Grapes, Apple, Banana, Strawberry, Orange, Pineapple, Lemon & Lime, Watermelon. Price tag crossed off on cover, but otherwise excellent condition. Fiber Flowers: Macrame, Weaving, Crochet, designed by Janet Prichard, Hazel Pearson Handicrafts, 1978. 10 flowers: MACRAME Fantasy Daisy, Cattail, Roses, Geranium, Sunflower, Daffodil, Anthurium; WEAVING Lily; CROCHET Violet; CROCHET & WEAVING Iris. Illustrated step- by- step for each technique. Price stickers on cover, but otherwise excellent condition. 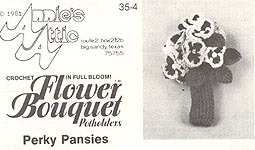 Floral Fantasy, designed by Barbara Anderson, Annie's Attic, 1990. 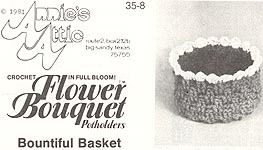 Digest-size booklet contains designs in a combination of yarns and thread include: Dutch Boy & Girl, Durch Shoe Planter & tulips, Primroses in Bowl, Lilacs in Watering Pitcher, Snapdragons in Bean Jar, Basket of Flowers, Bleeding Hearts in Sugar Bowl, and Poppies in Coffee Mug. Like new. 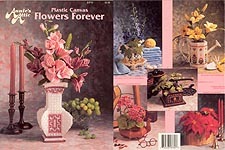 Plastic Canvas Flowers Forever, designed by Mary Layfield, Annie's Attic, 1990. Designs on 7- mesh include: Coffee Mill & Ivy, Delphinium in Pitcher & Washbowl, Gladiolus in Vase, Geranuim in Copper Kettle, Poinsettia in Basket, and Daylilies in Watering Can. Like new. May have very very slight perfumey smell. 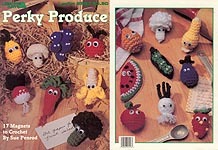 Perky Produce, designed by Sue Penrod, Leisure Arts, 1994. 17 Magnets to crochet in worsted weight yarn: Banana, Apple, Mushroom, Radish, Cauliflower, Grapes, Broccoli, Strawberry, Tangerine, Watermelon, Eggplant, Pea Pod, Squash, Carrot, Scallion, Lemon, Pear. Very good condition. 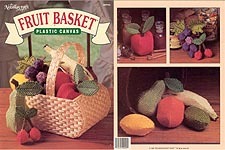 Fruit Basket in Plastic Canvas, designed by Sandra Miller- Maxfield and Fran Rohus, The Needlecraft Shop, 1989. Life-size Apple, Pear, Grapes & Cherries, Lemon & Lime, Orange, and Banana in decorative Basket. Lengthwise crease, but otherwise very good condition. May smell slightly of cigarette smoke. Wildflower Crochet, designed by Barbara Anderson, Annie's Attic, 1986. 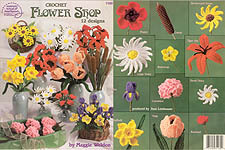 Digest-size book contains patterns for six arrangements crocheted using crochet cotton and worsted weight yarn: Straw Hat with Daisies, Bowl with Dog Roses, Vase with Tiger Lilies, Crock with Buttercups and Columbines, Cream Pitcher with Violets, and Hobmail Basket with Bachelor Buttons. May have someshelf wear to cover, but otherwise excellent condition. Crochet Flower Shop, designed by Maggie Weldon, American School of Needlework, 1993. Designs in worsted weight yarn include: Iris, Tulip, large and small Daisies, Tiger Lilies, Brown- Eyed Susans, Cattails, Poppies, Carnations, Daffodils, Buttercups, and Rosebuds. Like new. Lady Alice's Crocheted Bouquets, Book Three, designed by Alice Sophie Wallace, Wallace International, 1979. Plant designs in 3- ply yarn include: Santa Barbara Orchid, Orchid Corsage, Lily - Lilium, Sunrise Lily Bouquet, Lily Corsage, Pansy, Potted Pansy. Like new. 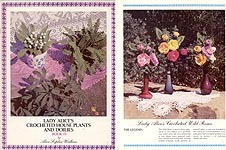 Lady Alice's Crocheted House Plants and Doilies, Book IV, designed by Alice Sophie Wallace, Wallace International, 1981. Plant designs include: Lily of the Valley, Boston Fern, Schlefflera Plant, and Wild Roses. Also: Wild Rose Doily, Pineapple Doily with Knot Stitch, and Diamond Pineapple Doily. Like new. 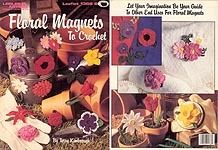 Floral Magnets to Crochet, designed by Terry Kimbrough, Leisure Arts, 1991. 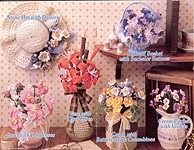 Worked in embroidery floss, designs include: Forget- Me- Nots, Petunia, Lily, Violets, Zinnias, Cosmos, Carnation, Daisy, Tulip. Pansy, Rose, Poppy, and Daffodil. Also use as appliques, jewelry, or stick in a small pot as a floral arrangement. Cover faded from store display, but otherwise like new. 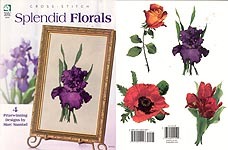 Country Flower Shoppe, designed by Fran Rohus, Carol Nartowicz, Sandra Miller Maxfield, and Donna Robertson, The Needlecraft Shop, 1998. Digest-size book contains patterns on 7- mesh plastic canvas for: Primrose, Aster, Tiger Lily, Poinsettia & Pinecones, Rose, Rosebuds, Daisy, Pontentilla, Posey, and Carnation. Flowers can be used in arrangements, or as a corsage. Like new. 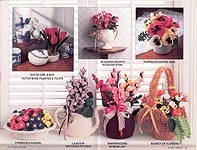 Plastic Canvas Floral Arrangements, designed by Mary Layfield, Annie's Attic, 1990. 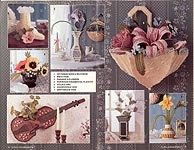 Digest-size book contains patterns on 7- mesh plastic canvas for: Victorian Shoe & Wild Rose, Iris & Vase, Parasol & Flowers, Poppies in Planter, Violin & Vine, Dogwood & Vase, Daffodils & Vase. Like new. Cactus Garden, Annie's Pattern Club, 1985. 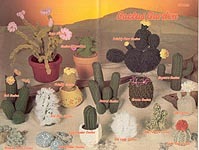 Digest-size book contains patterns for: Prickly Pear, Saguaro, Barrel Cactus, Crown Cactus, Old Lady Cactus, Lady Fingers Cactus, Turk's Cap Cactus, Lily Cactus, Zygo Cactus, Cob Cactus, Mexican Rock Cactus, Sand Dollar Cactus, Old Man Cactus, Egg Planter Cactus, Pricckly Cactus, and Cactus Pincushion. Some age- yellowing, but book feels like it has never been opened. Annie's Attic Flower Bouquet Potholders, designed by Annie Potter, Annie's Attic, 2008. 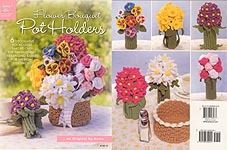 6 flower bouquet pot holders that fit over pot handles and a basket to hold them. Flowers include: Daisy, Hyacinth, Pink, Violets, Pansies, and Daffodils. Brand NEW! 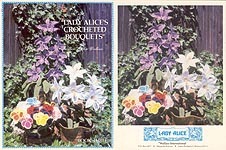 Flower Bouquet Potholders: Vibrant Violets, designed by Annie Potter, Annie's Attic, 1981. ORIGINAL black & white pattern sheet for flower bouquet pot holder that fits over pot handle. (Patterns reprinted in book form in 2008; see listing above). May be slightly age- yellowed, but overall very good condition. Flower Bouquet Potholders: Dandy Daffodils, designed by Annie Potter, Annie's Attic, 1981. ORIGINAL black & white pattern sheet for flower bouquet pot holder that fits over pot handle. (Patterns reprinted in book form in 2008; see listing above). Very good condition. 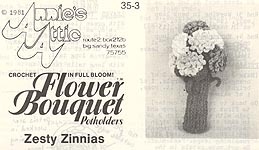 Flower Bouquet Potholders: Zesty Zinnias, designed by Annie Potter, Annie's Attic, 1981. ORIGINAL black & white pattern sheet for flower bouquet pot holder that fits over pot handle. (Patterns reprinted in book form in 2008; see listing above). Very good condition. Flower Bouquet Potholders: Perky Pansies, designed by Annie Potter, Annie's Attic, 1981. ORIGINAL black & white pattern sheet for flower bouquet pot holder that fits over pot handle. (Patterns reprinted in book form in 2008; see listing above). Very good condition. 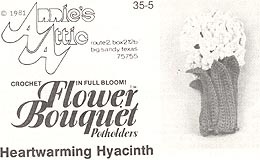 Flower Bouquet Potholders: Heartwarming Hyacinth, designed by Annie Potter, Annie's Attic, 1981. ORIGINAL black & white pattern sheet for flower bouquet pot holder that fits over pot handle. (Patterns reprinted in book form in 2008; see listing above). Very good condition. 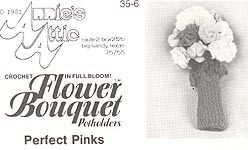 Flower Bouquet Potholders: Perfect Pinks, designed by Annie Potter, Annie's Attic, 1981. ORIGINAL black & white pattern sheet for flower bouquet pot holder that fits over pot handle. (Patterns reprinted in book form in 2008; see listing above). Very good condition. Flower Bouquet Potholders: Fresh- as- a- Daisy, designed by Annie Potter, Annie's Attic, 1981. ORIGINAL black & white pattern sheet for flower bouquet pot holder that fits over pot handle. (Patterns reprinted in book form in 2008; see listing above). May be slightly age- yellowed, but overall very good condition. Gladiolus in Vase, designed by Mary Layfield, Annie's International Plastic Canvas Club, 1991. Worked on 7- mesh plastic canvas, arrangement is 21" tall. 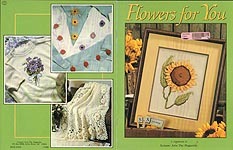 Flower Fridgies, designed by Mary Layfield, Annie's International Plastic Canvas Club, 1991. Designs on 7-mesh plastic canvas include: Lily, Black- Eyed Susan, Pansy, Poppy, Daisy, Tulip, Morning Glory. Fruit Fridgies, designed by Sandi Tucker, Annie's International Plastic Canvas Club, 1995. Plum, Grapes, Lime, Lemon, and Cherries worked on 10- mesh plastic canvas. SLightly wrinkled, but overall good condition. Plastic Canvas Doorstop Gardens, designed by Carol Nartowicz, The Needlecraft Shop, 1997. 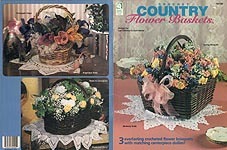 4 beautiful floral arrangements stitched on 7- mesh plastic canvas: Spring Bouquet (Primroses, Buttercups, Strawflowers); Autumn's Bounty (Sunflower, Poppy, Bachelor's Buttons, Thistle, Dandelions, Straw Flowers, Leaves); Summer Meadows (Roses, Straw Flowers, Primroses, Daisies, Dogwood); Valentine Roses. Excellent condition. Pineapple Centerpiece, Marshall Cavendish LTD, 1988. Digest- size leaflet from a subscription club. Worked in worsted weight yarn. Like new. Hanging Fern, Marshall Cavendish LTD, 1985. Digest- size leaflet from a subscription club . Worked in sport yarn. Like new. Everlasting Flowers, Marshall Cavendish LTD, 1985. Digest- size leaflet from a subscription club with patterns for Tulip, Daffodil, andIris worked in size 20 crochet cotton. Like new. Sweet Peas, Marshall Cavendish LTD, 1988. Digest- size leaflet from a subscription club . Worked in size 20 crochet cotton. Like new. A Cornucopia of Fruit to Crochet, designed by Sharon Compton, Leisure Arts, 1993. "Life- size" Orange, Lemon, Grapes, Apple, Pear, and Banana to crochet in worsted weight yarn. May have cover fading from store display but otherwise excellent condition. 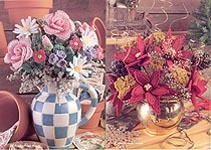 Plastic Canvas Floral Ornaments, designed by Carol Nartowicz, The Needlecraft Shop, 1994. 1 12 different flowers stitched on 14-count plastic canvas and displayed in plastic craft globes (but can be used on their own): Snowdrops, Primroses, Violets, Shasta Daisy, Hawthorne Berries, Rose, Larkspur, Poppy. Cosmos, Morning Glory, Chrysanthemum, and Holly. Name in ink on cover and faint perfume smell, but otherwise very good condition. Annie's Attic Garden Fresh Crochet, designed by Kathy Nussrallah Annie's Attic, 1983. Vegetables to crochet in worsted weight yarn include: Cucumber, Green Onion, Garlic, Red & White Radishes, Large & Small Mushrooms, Yellow Neck Squash, and Green or Wax Beans. Corners may be slightly bent, but otherwise very good condition. Plastic Canvas Window Gardens, designed by Carol Nartowicz, The Needlecraft Shop, 1995. Spring Splendor Flower Pots with Asters and Primroses; Summer Glory planter with Roses; Fall Flourish flower pots with Daisies, Potentillas, Mums, and Maple Leaves; and Winter Carnival planter with Poinsettias and Pinecones. New. Plastic Canvas Floral Fantasies I, Nifty Publishing Co., 1987. Ivy, Iris, and Daffodil stitched using 7- mesh and 10- mesh plastic canvas. Very good used condition. 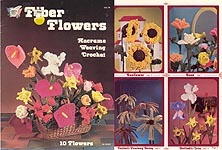 Crochet Flower Garden, designed by Barbara Anderson, The Crochet Catalog, 1988. Instructions for five different baskets of flowers or plants: Impatiens, Coleus, Crocus, Bird's Nest Fern, and Grecian Windflowers. Excellent condition. Pillow Patch: Pot of Jonquils, designed by Annie' Potter, Annie's Attic, 1982. Worked in worsted weight yarn. digest-size leaflet. May have impression from large paper clip at top, but overall excellent condition. Pillow Patch: Pot of Violets, designed by Annie' Potter, Annie's Attic, 1982. Worked in worsted weight yarn. digest-size leaflet. Excellent condition..
Pillow Patch: Pot of Geraniums, designed by Annie' Potter, Annie's Attic, 1982. Worked in worsted weight yarn. digest-size leaflet. May have impression from large paper clip at top, but overall excellent condition. Pillow Patch: Kettle of Zinnias, designed by Annie' Potter, Annie's Attic, 1982. Worked in worsted weight yarn. digest-size leaflet. May have impression from large paper clip at top, but overall excellent condition..
Pillow Patch: Oak Bucket Bouquet, designed by Annie' Potter, Annie's Attic, 1982. Worked in worsted weight yarn. 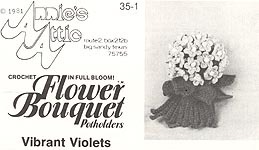 digest-size leaflet; features Violets, Daisies, Jonquils, and Pansies. Excellent condition. 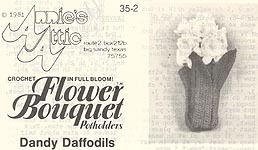 Pillow Patch: Coffee Pot Bouquet, designed by Annie' Potter, Annie's Attic, 1982. Worked in worsted weight yarn. 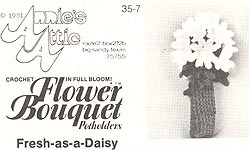 digest-size leaflet; features Daisies and Sunflowers. Excellent condition. Pillow Patch: Football Mum, designed by Annie' Potter, Annie's Attic, 1982. Worked in worsted weight yarn. digest-size leaflet. May have impression from large paper clip at top, but overall excellent condition..
Botanical Beauties, designed by Barbara Anderson, Annie's Attic, 2009. Spider Plant & Planter, and English Ivy in Planter, worked in worsted weight yarn. Full-size pattern leaflet. Like new, but may smell of cigarette smoke. Hanging Gardens: Spider Plant, designed by Barbara Anderson, Annie's Attic, 1981, 1984. Worked in worsted weight yarn. digest-size leaflet. Like new. Hanging Gardens: Spider Plant, designed by Barbara Anderson, Annie's Attic, 1981. Worked in worsted weight yarn. Hard-to-find, ORIGINAL black and white version. Sightly bent corner, but otherwise very good condition. Hanging Gardens: Spider Plant, designed by Barbara Anderson, Annie's Attic, 1981. Worked in worsted weight yarn. Hard-to-find, ORIGINAL black and white version. Very wrinkled, but all instructions present & readable. Hanging Gardens: English Ivy, designed by Barbara Anderson, Annie's Attic, 1981, 1984. Worked in worsted weight yarn. digest-size leaflet. Like new. Hanging Gardens: English Ivy, designed by Barbara Anderson, Annie's Attic, 1981, 1984. Worked in worsted weight yarn. Hard-to-find, ORIGINAL black and white version. Folded for original mailing, slight wrinkling and a little fragile along creases, but otherwise good condition. Hanging Gardens: Boston Fern, designed by Barbara Anderson, Annie's Attic, 1981, 1984. Worked in worsted weight yarn. digest-size leaflet. Like new. Hanging Gardens: Boston Fern, designed by Barbara Anderson, Annie's Attic, 1981, 1984. Worked in worsted weight yarn. digest-size leaflet. Hard-to-find, ORIGINAL black and white version. Folded for original mailing & slight wrinkling and a little fragile along creases, but otherwise good condition. Hanging Gardens: Chocolate Soldier, designed by Barbara Anderson, Annie's Attic, 1981, 1984. Worked in worsted weight yarn. digest-size leaflet. Like new. Hanging Gardens: Chocolate Soldier, designed by Barbara Anderson, Annie's Attic, 1981, 1984. Worked in worsted weight yarn. ORIGINAL black and white version. Folded for original mailing & slight wrinkling and a little fragile along creases, but otherwise good condition. Hanging Gardens: Purple Passion, designed by Barbara Anderson, Annie's Attic, 1981, 1984. Worked in worsted weight yarn. digest-size leaflet. Like new. Hanging Gardens: Purple Passion, designed by Barbara Anderson, Annie's Attic, 1981, 1984. Worked in worsted weight yarn. Folded for original mailing & some wrinkling, but otherwise good condition. Hanging Gardens: Starlite, designed by Barbara Anderson, Annie's Attic, 1981, 1984. Worked in worsted weight yarn. digest-size leaflet. Like new. Hanging Gardens: Starlite, designed by Barbara Anderson, Annie's Attic, 1981, 1984. Worked in worsted weight yarn. Folded for original mailing & slight wrinkling and somewhat fragile along creases, but otherwise good condition.